LittleThumb is the digital solution with which you are never lost: a simple and effective answer to all the problems of positioning and navigation in pedestrians environments. Easy to install and implement, it allows you to find your way with one simple gesture. 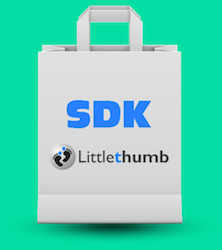 You just have to install the LittleThumb application (available soon also on IPhone and WindowsPhone) on your smartphone. Small digital stones, the StoneTags are cleverly distributed in an environment according to its configuration. They are easily visually recognizable thanks to their logo. Equipped with the NFC technology, they can be read in an instant by a smartphone equipped with the application or the SDK LittleThumb. The memory of StoneTags contains the digital map of the environment, which can be thus downloaded even when no internet connection is available. 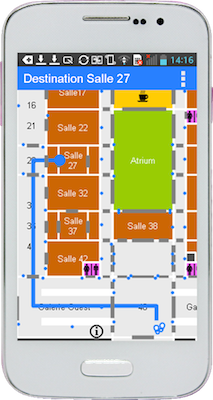 The StoneTags installed all over a site allow the map to be displayed in an instant on the smartphone, locate itself and navigate towards a selected destination. They can be completed by BLE beacons, WiFi signal detection or the availability of GPS positioning in crowded, wide open spaces or outdoor areas. And for those who are not yet equipped with the NFC technology, a code in the image of the tag allows it to be identified it with the camera of the telephone. A simple gesture and a few seconds are enough to show the site map and access the functions of positioning and navigation! The StoneTags are visible and easily recognizable. With their logo they indicate the presence of a LittleThumb infrastructure on the site. It is then enough to switch on and approach your smartphone to a StoneTag in order to start the LittleThumb application and read the content of the tag. No need to search, configure, or wait for a slow download. After selecting a destination and obtaining a route, the dynamic avatar representing the user's position on the screen allows you to start moving in the correct direction. The position is maintained during the first steps to be certain to follow the right direction. Then it can be updated instantly by simply reading a new StoneTag or eventually by detecting a BLE beacon or a GPS position. No cabling, energy source or prior calibration is necessary. 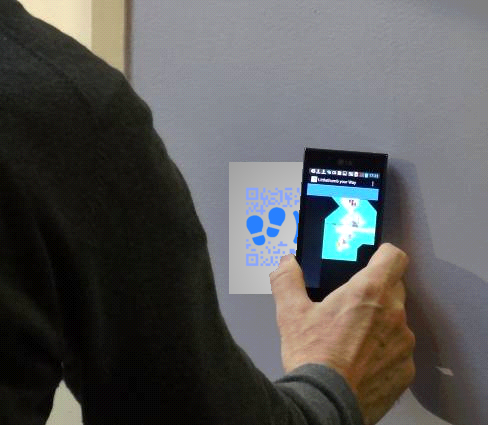 The StoneTags, equipped with the NFC technology, are completely autonomous, powered by the energy of the smartphone. They emit at very short distances (5 cm) and very low power only when they are excited. Furthermore LittleThumb does not need a WiFi or mobile network connexion to work and can be installed in every type of environment. 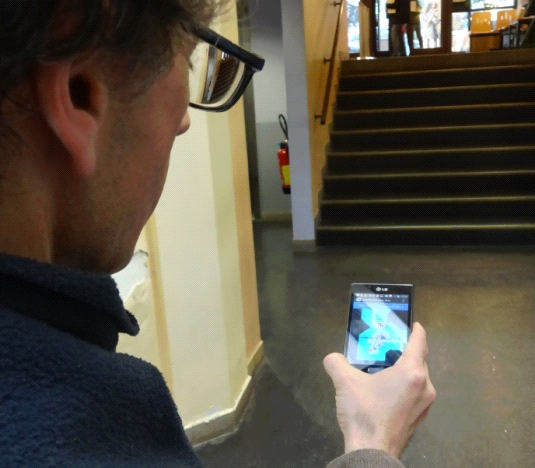 The map of the environment is stored in the StoneTags and is read directly by the smartphone. The StoneTags can have various forms, from small boxes to simple stickers, and are attached by screwing, sticking or adhesive. They are customizable at will, their color, material and shape can be adapted to the architecture and decoration of the site. They also work outdoors, even in difficult weather conditions. LittleThumb is a complete, turnkey and easy to implement solution for a site manager. 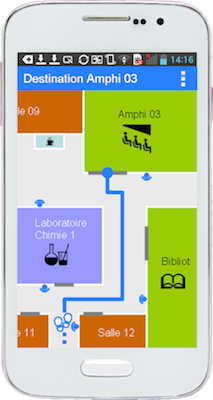 Everything is included: creation and compilation of the cartographic model, installation and programming of the tags, availability of the mobile application or an SDK for integration into an existing application. The positioning and navigation infrastructure of Little Thumb is open to other services and applications. 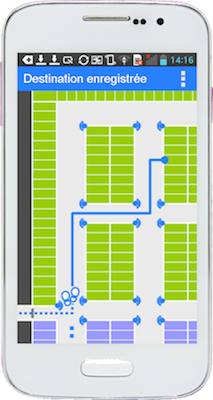 An SDK will soon allow other developments to integrate the features of tag reading, map loading, positioning, navigation, etc.